As Tommy Ton snapped away at the sartorial peacocks parading around Pitti Uomo, it was his own mix of print and textures that caught my eye. 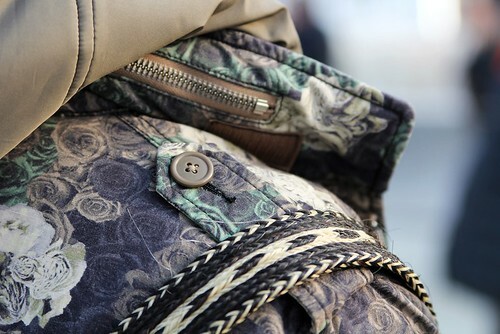 I love the mix of Patrik Ervell's braided horeshair strapped backpack and layering of his rose print jacket by Miharayasuhiro worn over a quilted jacket by Andrea Pompilio. *sigh* I still really want one of those Ervell bags. And that Mihara print is fantastic. There really only one Tommy Ton who can show details in new light. I love the Miharayasuhiro jacket. I love reading your blog, and if you get the chance would be greatful for any feedback you might have on my own. Syed: Tommy has the matching rose print trousers by Mihara but he wasn't wearing the full combo. James Gerrard: Tommy has the eye, both behind the camera and in front of it like he is here. Thanks, I've bookmarked your blog to read this evening. nice details indeed. Tell him that we can't wait his pictures on his, they are great !! Hmm, that's really classy. Great find! hi! I recently started a mens fashion blog and would love for you to take a look at it. maybe you could tell me what you like or don't like about it so I can make improvements! if you like it and follow it that would be amazing! That jacket is awesome! even if the inside was lined with a plain outside looks great. prints are all i want right now. theres a print similar to this jacket at ASOS right now, printed on cord. great post. love the prints. As Tommy Ton clicked away at the sartorial peacocks parading around Pitti Uomo, it was his own mix of list and designs that found my eye.